New Glarus Brewing Company (in New Glarus, WI), is a family run brewery in small-town southern Wisconsin. I have never tried a beer from them that I didn’t like. I don’t know if New Glarus considers Spotted Cow to be their flagship brew, but it’s definitely the most popular. Spotted Cow is a cask-conditioned light farmhouse ale which goes with just about anything. New Glarus lists 22 different foods which go well with Spotted Cow. The yeast is left in the bottle which gives the beer a naturally cloudy color, and enhances all the great flavors. It’s a little fruity, not very hoppy, and very easy to drink. If you have the good luck to live in or near Wisconsin, pick one up and TRY it. Spotted Cow is perfect for any time of year and any beer drinker. It’s full of flavor, but not bitter or heavy. I could drink this all night, if not for the fact that I live in New York right now and the only way of getting Spotted Cow is for my wonderful parents to bring it to me. 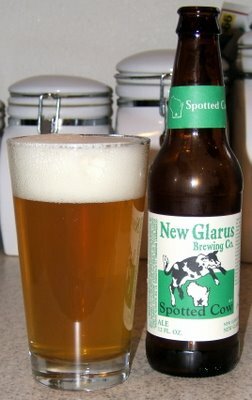 I’ve yet to find a beer that tastes like Spotted Cow. If I had to pick something, I’d say that it’s a combination of a cream ale and a saison. Try this if you like: Goose Island Sofie, Lift Bridge Farmgirl Saison. You’re totally right about it being a combination of a cream ale and a saison. When I homebrewed a spotted cow clone (I called mine “striped cow”), I used a basic farmhouse cream ale recipe with a saison yeast strain. Turned out pretty tasty, if I do say so myself. Spotted Cow is also one of my favorite beers, not in the least because it’s on tap at pretty much every bar in the state of Wisconsin. Your Striped Cow was right on too. And I love that it’s on tap in any bar in Wisconsin. I also love that Chicago isn’t very far from the border so soon I will be able to get it in a more regular fashion!